PARIS 2e: Vive! Vive! Vive! 0 Comments Published by Cedric Benetti on Saturday, June 23, 2007 at 6/23/2007 02:48:00 PM. Today is National Luxembourg Day! Unfortunately I'm still in Paris, and the festivities take place far away from me, but my mind is with the merry drunken people of last night who filled the narrow bars and streets of the capital to kick off the celebrations! Our National Holiday is not actually the day we gained our independence but it is settled as the Grand Duke's Official Birthday since 1961, on the 23rd of June, although this has never been the actual birthday of any ruler of Luxembourg. The monarch's birthday has not always been celebrated on 23 June. Under William I (1815–40), the date was 24 April (although his actual birthday was 25 August), and under William II (1840–1849), it was 6 December, his actual birthday. This change created the strange situation of celebrating two Grand Ducal birthdays in 1840. Under William III (1849–90), the date was set at 17 June until 1859, after which, his birthday was celebrated on 19 February: two days after his actual birthday. 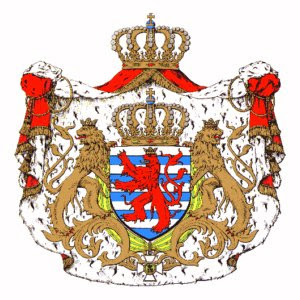 With the separation of the orders of succession, the Dutch and Luxembourgois thrones split in 1890. The Nassau-Weilburg monarchs celebrated their Official Birthdays on their actual birthdays. In 1947, the day was declared the 'national holiday'. As both the reigning Charlotte and the Heir Apparent (and regent) Jean were born in January, it was feared that their actual birthdays, therefore the nation's holiday, would be marred by poor weather. Thus, on 23 December 1961, the date was fixed on 23 June by Grand Ducal decree.